boring...love the canadian history/location but the movie put me to sleep! scott speedman's performance made this movie what it was, an interesting story about a notorious canadian bank robber. loved the set design and costume from the era as well. this was a good movie to take my wife to. there was good action and you could not really tell it was a canadian production. i liked this movie. there was lots of action and a believable story line. good to see a movie about a canadian - even tho a criminal! very enjoyable, good acting. not just a true story but a true story about toronto. i generally really like true stories and i liked this one very much. one thing i liked was one of the guys looked like a young christopher walken. that was cool. but any way, it was a good story with interesting history points. based on a true story. 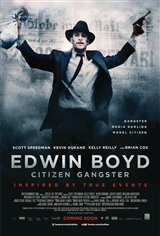 scott speedman did a wonderful job portraying edwin boyd. at the end of the movie you learn why he is the "citizen gangster". i would highly recommend this film. a must see! good first movie of this director. use of black and white and colour contrast dramatically used. great historical canadiana.